Sometimes a full kitchen remodel is just what the doctor ordered. But sometimes, the better alternative is cabinet refinishing. 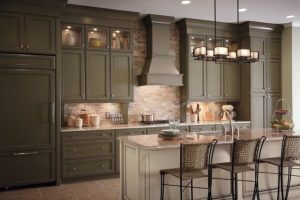 Let Excellence Custom Painting give your aging cabinets a new look and many years of continued use. Our experienced team will save you time and money by restoring your cabinets using paint or stain of your choice, which will complement your home and your style. Great results in refinishing cabinets are based on two important steps – thoroughly removing existing finish and masterfully applying new paint or stain. At Excellent Custom Painting we have vast knowledge of various types of wood and experience working with various paints and finishes. We will carefully remove the existing finish using a professional sanding tool. It’s true, sanding takes time and you could spend all day sanding to properly prepare old cabinets for new paint. However, solvents and deglossers contain harmful chemicals. If you are concerned about harsh chemicals, using power sanding equipment to remove old finish is the right choice for you. I know what you’re thinking – sanding produces lots of dust, but fear no more, we use professional dust-free sanding equipment, which delivers great results and eliminates the dust problem. Once your cabinets are perfectly prepped, then we skillfully apply your choice of stain or paint. We can customize any color to match other furniture in your home or create a specialty shade that is unique to your taste and cannot be purchased at the local paint shop. So, don’t let your old cabinets go to waste. Consult with us before you spend lots of money on new cabinets.